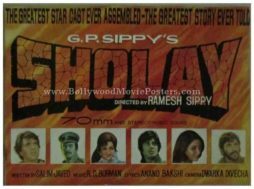 Old Bollywood pressbook of one of the greatest films in Indian cinema, Sholay (1975) for sale. 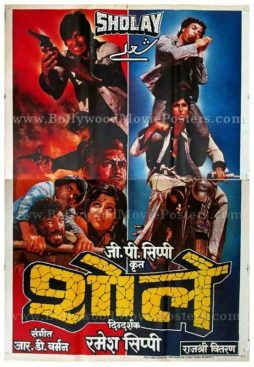 This is an actual surviving rare Bollywood old pressbook of the 1975 Hindi film that is considered the greatest film ever made in Indian cinema. 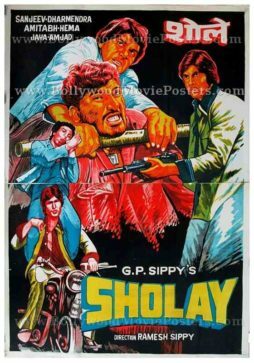 Printed and circulated during the original first release of Sholay in 1975, this rare Bollywood old pressbook was printed and distributed to cinema audiences that thronged to movie halls to see the film. 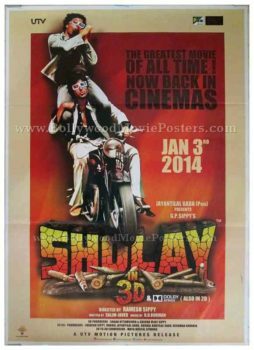 Sholay is the highest grossing film of all time in Indian cinema and unanimously regarded as the greatest film ever made in Bollywood, making this rare Bollywood old pressbook highly collectible! 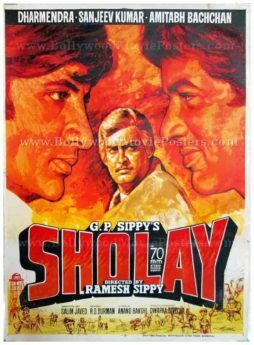 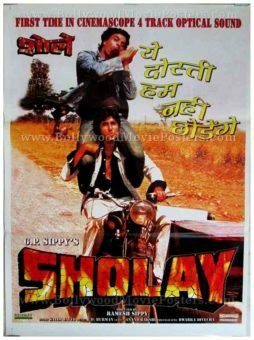 Sholay, declared the “Film of the Millennium” by BBC India in 1999, is an unforgettable classic that has become almost synonymous with ‘masala’ in Indian cinema. 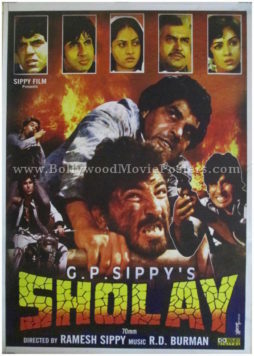 Its characters such as Jai, Veeru, Basanti, Thakur & Gabbar Singh have been etched into history. 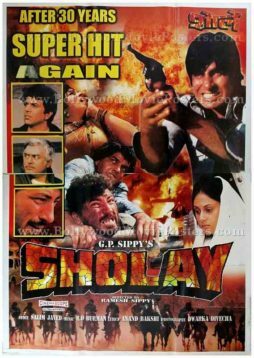 The film has an unbeaten record for running for over five consecutive years after being released. 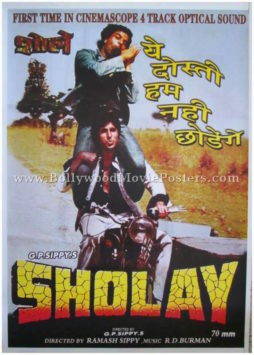 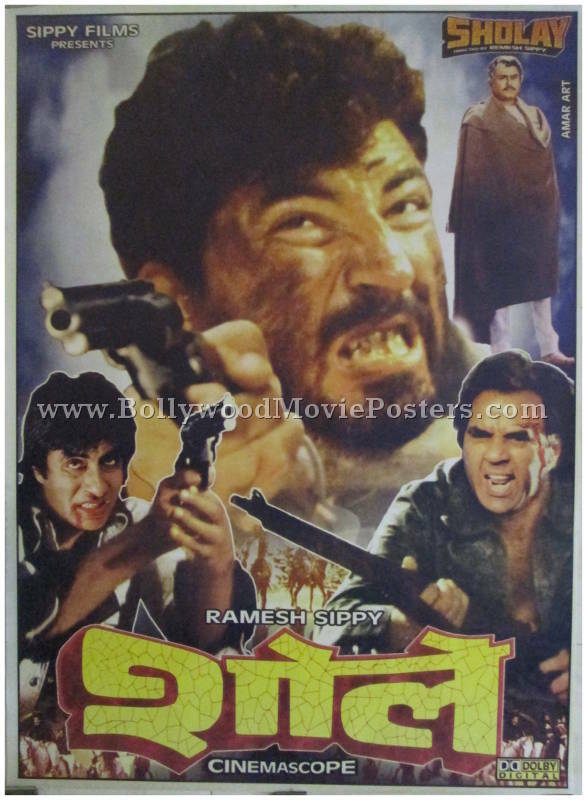 Sholay enjoys a cult following in India and its dialogues are often quoted in various media.